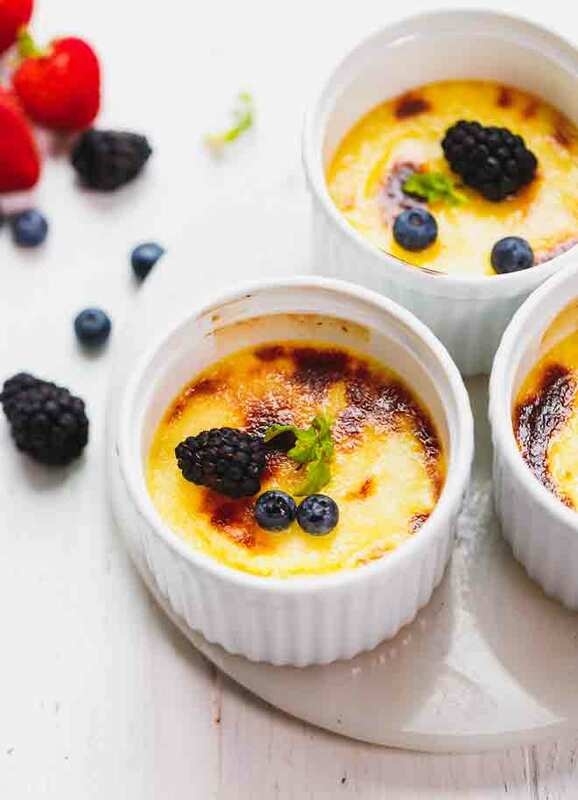 A healthier spin on a very popular dessert, this low-carb creme brulee is creamy and decadent, but sugar free. Smooth custard underneath crunchy caramelized top, makes a dreamy dessert, ready in 40 minutes with just 4 ingredients. This recipe for low-carb creme brulee dessert inspired me to make low-carb creme brulee cheesecake, so stay tuned for the recipe. This is one of the easiest dessert recipes to convert to low-carb. The main difference is in the sweetener used. For classic creme brulee you use regular white sugar. For the low-carb version, you need to use a Keto friendly sweetener. All other ingredients are the same. Preheat oven to 325 F. Prepare 4 ramekins and a pan large enough to fit all 4 of them. Place heavy cream and 1 tbsp of the sweetener in a sauce pan. Bring to a boil and immediately remove from heat. In a bowl, combine egg yolks and 4 tbsp sweetener. Add vanilla. Whisk until the sweetener has been incorporated. Add 1/2 cup of the hot cream to the egg yolk mixture and whisk to combine. Pour the mixture back to the pot with heavy cream. Whisk to combine. Divide mixture between 4 ramekins. Place ramekins in the baking dish. Pour about 2-3 cups hot water inside the baking dish so it covers about 1-inch of the ramekins. Bake for 30-40 minutes, until the tops are set, but still wiggly. Remove form the oven and let the creme brûlée cool to room temperature. Cover each ramekin and refrigerate. Sprinkle 1 tsp of sweetener on top of each brûlée and using a kitchen torch melt until it caramelizes.